The Tsali (SAH-lee) Recreation Area in Nantahala National Forest is mountain biking heaven, and also a great area for horseback riding. 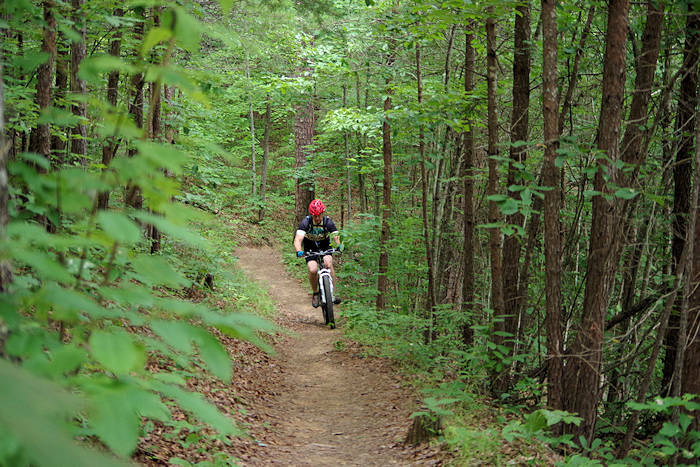 It's a top destination for mountain biking in North Carolina and even the entire eastern USA. Containing nearly 40 miles of trails in a system with four excellent loops, it has been rated as one of the top 10 places to ride in the country! 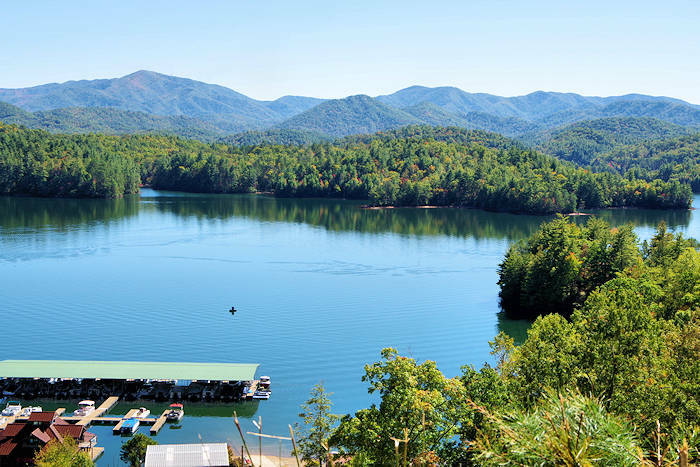 The area is located on a hilly peninsula reaching into beautiful Fontana Lake, at the base of the Great Smoky Mountains. The nearest town is Bryson City, home to two helpful bike shops downtown with rentals and supplies, Nantahala Brewing and a good variety of restaurants for post ride recovery. The four long main trails at Tsali wind along the lakeshore and onto the wooded, steep interior ridgelines, and many connector trails, gravel roads and extension trails make rides at Tsali even longer, more scenic, and more fun! Three main overlooks along the trails provide sweeping views of Fontana Lake with the Great Smoky Mountains National Park on the other side. The trails are fast, hardpacked singletrack, and they're extremely well designed and well used. Trails alternate use between mountain bikers and horseback riders on different days, two will always be open to mountain biking. There is a $2 trail use fee for one day (honor system, bring cash), but Tsali is well worth two bucks! 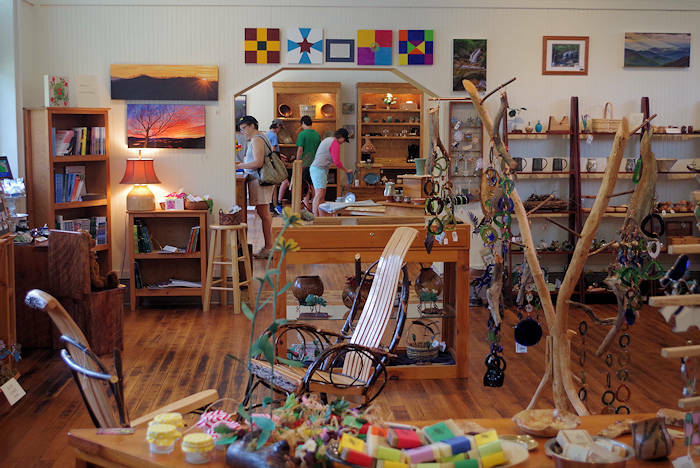 Located in Graham County, there is much to do nearby including Stecoah Valley Arts Center just 8 miles away. Read all about Robbinsville and Graham County. 18 new color trail maps have been installed on the four multi-use trails at Tsali Recreation Area. Maps were installed at every trail intersection to help with navigation and emergency response. In addition to a “You Are Here” designation, each map has a unique number that can be used by rescue and Forest Service personnel to pinpoint location. Open early April through October, the Tsali Campground offers 42 campsites on a first-come, first-served basis. Many sites accommodate small RVs, but no hookups are available. Each campsite has a picnic table, fire ring and lantern post. Accessible flush toilets, hot showers and drinking water are available. Campers pay fees at the campground fee station. Tsali's jumping off point is the end of FR 1286, where the trailhead, campground, and boat launch are located. Tsali can be quite crowded on summer weekends. This means the parking lot will probably be pretty full. Don't let this deter you from riding here, however. Finding a place to park is not a problem unless there's an event such as a race going on. 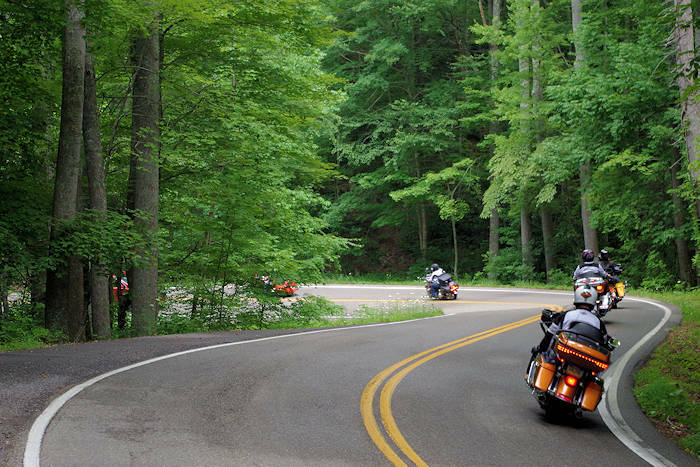 While on the trails, you might encounter other riders frequently - so keep that in mind as you pick up speed. Despite this, the trails are hardly ever so crowded that you can't find seclusion. Even on the most crowded days, you can often ride for miles without seeing anyone else. To avoid the crowds, try to visit during the week. 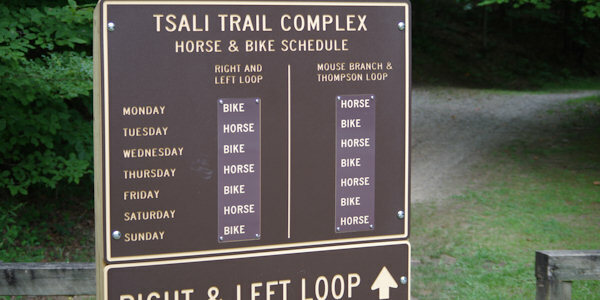 Tsali's Left and Right Loop trails can be combined to make a great, but difficult, 18-mile ride. From Asheville, take I-40 West to Exit 27. Follow Highway 74 past Bryson City (Great Smoky Mountains Expressway) to intersection with NC 28 North. Follow NC 28 North about 3 miles to the sign for the Tsali Recreation Area; turn right. Follow this paved road to the campground and trailhead parking lot; park in the lot signed "Riders Park and Pay Here." Download the National Forest Service Tsali Guide.